Since the 90’s, there have been a boggling amount of changes in styles and genres of popular music. Of course, the industry will forever be evolving and tastes forever changing, but we often have to wonder to what degree these shifts are engineered by record labels. It’s no question that labels can manufacture artists based on what they think will be popular, and that organic or deeply original artists are often shut down in their attempts to maintain creative control. Luckily, the internet—with its piracy and streaming and all-around democratizing abilities—showed up just in time to wrest some power back into the hands of the people. Sure, there will be industry plants in an industry desperate to forecast or replicate popularity, but with the ubiquity of SoundCloud, online streaming, and social media, more artists have been able to pave the path to success independently and with integrity. 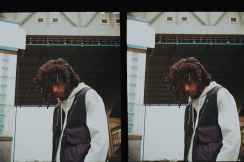 6LACK is another young artist coming out of chart-dominating Atlanta to gain attention in the mainstream—and one who has spent much of his young career proving he will not be made an industry plant. He parted ways with his first label in 2011, and shortly after we were hearing him everywhere—his songs bumping in the Snapchat updates of everyone from Kylie Jenner to YesJulz. 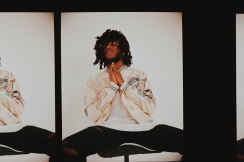 Amidst the flurry of a North American tour, 6LACK put aside some time to talk with Katrina Lainsbury about taking control and standing your ground. He may not be a plant, but he’s certainly in bloom. Six has been a recurring number in my life. I always see it. I was born in the sixth month, I’m from Zone 6 in Atlanta, and six is my favorite number. I always went by Black, and as I got older, six was the number that represented me. I’m a good sport, I’m willing to try and test my limits to see what I can do—but I never wanted that to turn into people pushing something on me that I didn’t want for myself. At that point, I had a strong sense of where I wanted to go. I didn’t feel like anybody could steer me or stray me away from it. I’ve seen enough of the ugly side of the industry to know what to expect. Nothing came as a surprise; nothing could blindside me or catch me off guard. It’s perfect. It’s good to have those relationships with those people, so you know when something is right or wrong. You can actually talk to somebody, in a way that you can’t really talk to other people sometimes. I enjoy being on the road with friends and I enjoy my road group being my actual family versus just a group of people doing their jobs. I’m open to trying things and stepping outside of my comfort zone, because that’s the only way to figure out what you can do. But there’s a difference between that, and being told “you should do this, you should sound like this,” and that’s the case with a lot of labels. If you don’t have something going in—if you don’t have an image, or a fan-base, or an idea of who you are—they’ll run the show. I don’t want anybody else running my show. Bears are calm and collected, they have a certain peace about them, but you always hear the phrase “don’t poke the bear.” It’s a peaceful animal, but you should never, ever, test your limits with it. Bears represent strength, power, and dominance. I felt like they represented me the most. The bear was a part of an old piece of cover art I had. I looked at old cover art, and I looked at the bear, and thought, that might be where we need to take this next. The bear in the “PRBLMS” video, and on the Free 6LACK cover, his name was Bam Bam. I prepared for it, and I made sure I did everything that I could do to get here, but you never know how fast things will grow and how big they will be. In January, I was performing in a 600-capacity venue, and four months later, I was performing in front of 15,000 people. You never know what will happen. I started off drawing, that was my first thing. I just gravitated towards music more. There are plenty of things I find myself getting into over the years, but right now, it’s about mastering one thing at a time. I love music. I know I’m not as good as I want to be, and I want to continue doing everything to figure out the music part first. I went from battle rapping to just rapping and making songs. From there, it was learning how to sing, and to record and engineer myself. It was all in steps. I would teach myself one thing at a time. When you think about the years from '92 to now, it’s not that many years, but we’ve literally gone through at least 15, 20 sounds in hip-hop. It’s amazing to watch. There have been so many different sounds, so many different styles, so many different looks. I’m just happy to be a part of it, honestly. Every few years we have some kind of shift or change, and I think that’s the great thing about music. I’ve always been an observer, someone who studies what’s going on. My goal is to always keep up. I would say “Free.” It was the last song I made, at the end of my trip to L.A. “Free” was literally everything I felt. I talked about every feeling I had felt in regards to my relationships, to who I was, to all the labels—everything. I wanted to get it out in that song. By the time I was done with it, the title of the track was obvious. It’s cool to be on the road. Every day I wake up thinking about making more music, thinking about ways to stay here, and to stay in people’s faces. I’m playing everything day by day. I’ll have plans this year, and next year, and the year after and the year after. The minute I finished the last project, I was in the studio two weeks later working on what was next. I don’t have any plans to fall back or go off the radar. I want to stay present, and I want to stay consistent. I want to get better.